The fountain of youth under the leaking pipeline ... in old Belleville, N.J.
Four decades later, I return to the pipeline. The dragon's tail is less pronounced, and full-grown trees hide the view of homes on Sycamore. “Hey, Ant! You got a third eye!” Gary yells but it doesn’t help me see much better. Fumbling, I pick up my twenty-six-inch Schwinn, but I drop it just as quickly. Then pick it up again. Holding it up, it’s holding me up. Gary is staring at me. I sense this more than I see it. Can’t see much of anything really. Gary looks like a tree, the bike in my hand, a tangled red bush. The world isn’t spinning but it’s coming in cloudy. I sense something tremendous has transformed my eight-year-old body. “That’s what happens when your bike hits a rock on the pipeline,” Gary explains. “You need to work on your landing,” Gary says. 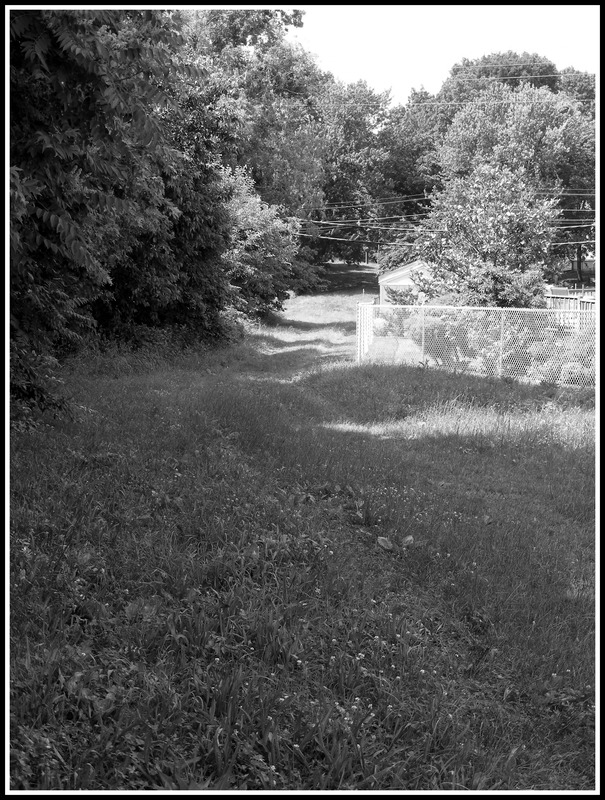 Near the border of Nutley and Belleville, at the end of our dead end street, Gless Avenue, a large overgrown field crosses our block like a T. Our street is the stanchion and the cross piece is the field on the T.
Above the fallow field, high in the sky, humming wires sag from tower to tower, running east and west, as far as the eye could see up the hill past Passaic Avenue and down the hill towards Nutley. Joey, who lives in the corner house, says the wires go all the way to Texas. And Joey, being two years older than most of us, and way more mature in every way, would know these things about our town and the high-tension lines and about Texas, too. He’s new on the block, and moved in from Montclair where he constantly reminds us that everything is bigger and better than Gless Avenue and Belleville, too. A hundred feet or so into the field a dragon-like hump rises on our right slicing the horizon into near and far, the near being our fields and the far being Sycamore Drive, straight across. The hump extends to off to our left, south, to a rising mound topped by creepy looking phallic vents before the mound falls away and the underground pipes sink again to cross under Chestnut Street past the bog to the reservoir on Joralemon. We call it the pipeline. It rises high above the field and usually offers dry passage when the fields are flooded and the worn paths we trampled through the grass are pocked with puddles. 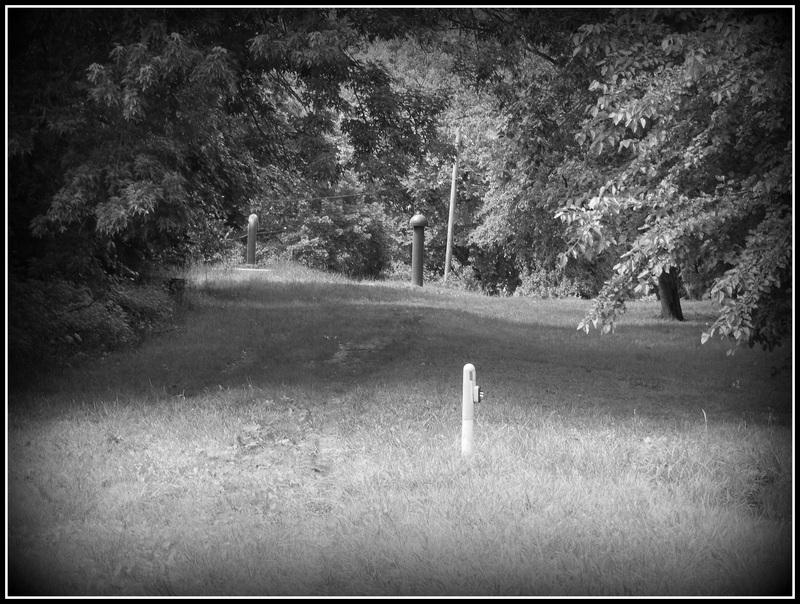 Nearly diagonal of the entrance from Gless Avenue straight off into the field and partially hidden in the undergrowth from a brick wall about four feet high and about six feet wide there’s a section of heavy pipe about two feet wide in diameter extending from the stones into space about the same. Inside the pipe it’s dark and dry, and at times we take turns crawling in to it as a hiding place, but not for long for. It creeps out us non spelunkers. Even sliding in feet first, no one wanted to hang out inside the pipe with the spiders, bugs and darkness for very long or at all. The other end of the pipe crosses under and appears on the far side of the pipeline. Our tube apparently runs under the dragon hump, drawing water flowing down the hill and otherwise pooling on the other side forming a place for mosquitoes to hang out and procreate. Providing an underground route for the water, our pipe provided a bypass to continue downhill. On the stone wall side of the extruding pipe it poured out to a trickling stream where occasionally we saw a wandering frog or box turtle. At the base of the wall bubbled fresh water. We kids trusted that water, especially after a hike through the weeds or a game of war. Straddling on big rocks beside the underground fountain, our palms together, we bumped each other into the shallow water so we could be first to drink. We scooped handfuls of cool, fresh clean water to our sweaty faces and drank the transparent treat down our dry Jersey throats. No reason to go all the way home to the fridge or outside faucet for a drink. That spring water bubbled into that creek for years. We looked forward to summers and planned our play around it. If we were biking the dragon’s tail of the pipeline, or crawling on our bellies through the grasses refighting World War Two, or simply trying to figure out where the wires on the single tower actually ended, we always rewarded ourselves with a turn at the spring water of our youth. One day when we were in school the big trucks rolled up in the field. They hauled in back hoes and cranes, and large flatbeds with concrete cylinders you could walk through. Except, we weren’t allowed to walk through them, or play on them. Even though our mothers had not been to the end of the field, somehow they knew to warn us to stay clear. But one summer day, with my cousins Tommy and Bobby, both older than me, we ventured to the field to see what was going on. We hadn’t gone too near the site when Tommy pointed out a wasp on my temple. And before I could react, I’d been stung. So, of course, our image of First Aid was limited and I high-tailed it home, Tommy and Bobby right behind me, to my mom who would know how to heal this sting. There was a lot of noise in the field for weeks and when we returned, the spring was gone and the field and pipeline muddied but virtually unchanged. We could still race our bikes up and down the rough trail along the top of the water pipeline, but a cool drink no longer awaited to quench our thirst. It had become an outlet pipe for rainwater runoff. Four decades later, I return to the pipeline. The fields are still there and now two towers carry power lines above where the spring of youth flowed. The dragon tail is less pronounced now, and full grown trees hide the view of the homes on Sycamore. By memory I find the low depression where our spring flowed, but it is over grown and now taunts an old man in his memories to define its existence. I again walk the pipeline to where the phallic vents once marked a highpoint. It’s not so high anymore. I can tell that the lie of the pipeline, the dragon’s hump, is now to the west of where the path has filled in. I am sure no one else would know this. I also know that no one will ever ride a bike here or hit a rock and fly, if just for a moment or an eternity. Web site will receive a stipend for purchases made through the Amazon.com link.